Your child’s cute pudgy little fingers don’t stay little long enough. Although having little ones often feels like those pudgy little fingerprints are all over… all over the windows, sticky fingerprints all over the counter. But there is actually one perfect place for fingerprints... the Christmas tree! And one of the most precious ways to capture those prints… handprint ornaments. I’m a sucker for my boys’ handprint ornaments. Christmas is a time when we count our blessings (an extra time), when we think of years past and family traditions. So stamping their little hands on an ornament creates a sentimental and special keepsake to cherish for years to come. And these Santa Handprint Ornaments add both sentiment and silly to the tree! A couple years ago I was perusing Pinterest looking for a last minute ornament to make with my boys. 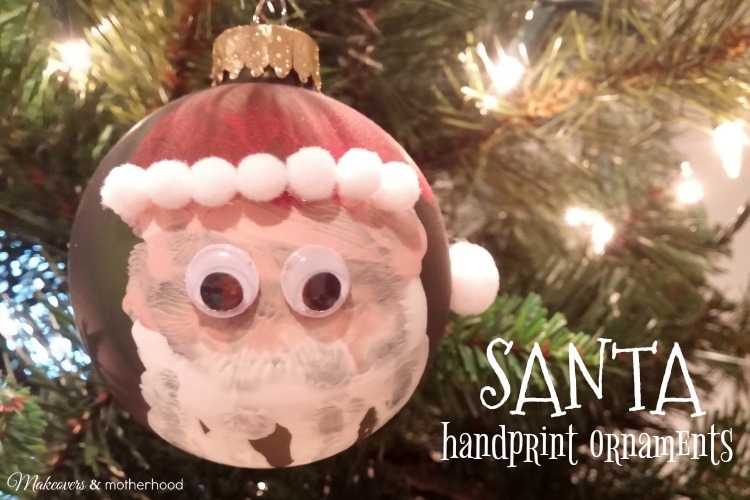 There were soooooo many cute options, but I had specific requirements… I wanted handprints, I wanted to use the glass ornaments I’d already purchased, I wanted Santa, and I wanted it to be simple. So it wasn’t surprising that when I closed the lid of my laptop I had nothing. Even though I have three boys, I worked with each child individually in making these ornaments. 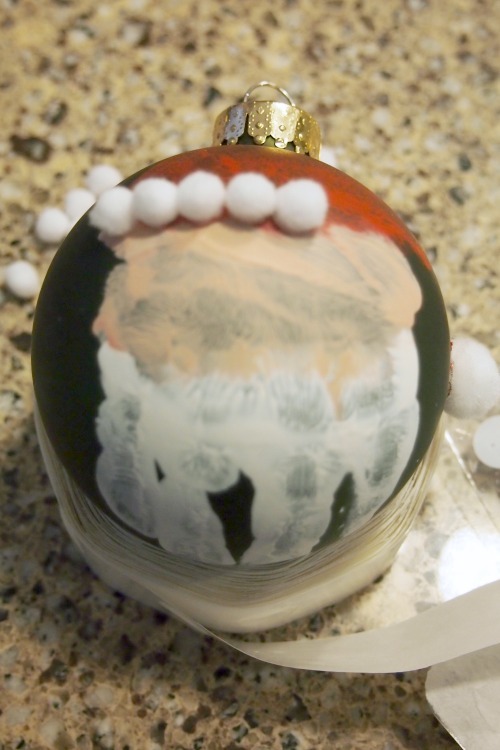 Each kid made 6 ornaments (we have lots of grandparents) and it took about 10 minutes to do just the paint stamping of Santa for each child. 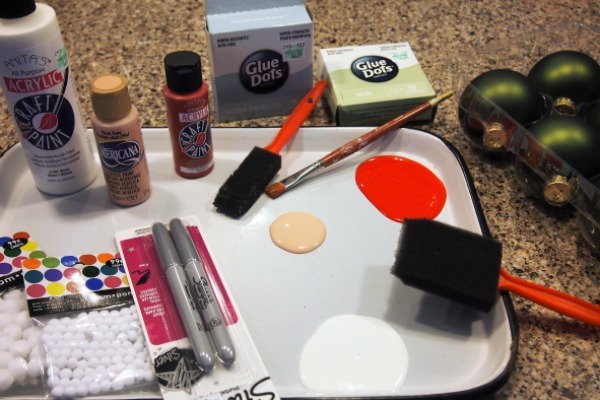 Since the paint will dry, you want to keep moving. I painted the hat first, then the beard, then the face. Asking the child keeps to keep their hand open wide is key here. YOU hold the ornament. You’ll need to hold it firmly against the child’s hand. 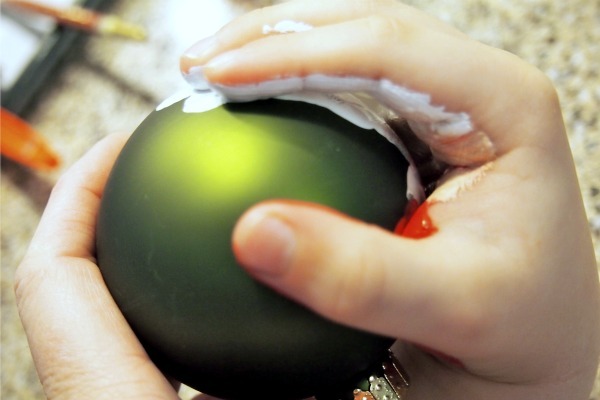 AND… place the palm of their hand on the ornament first and then roll the ornament up to their fingers and press firmly. Hopefully you can get the idea from the picture. I know, it’s kinda awkward to figure out. You should’ve seen me trying to take the picture while doing this! Ha ha… super awkward. It won’t take long for the paint to dry. By the time the last child’s handprints were stamped and I cleaned up the paint supplies, the first round of ornaments were dry. So if you need to make a gift quickly… you’re in luck here. Since my boys were playing nicely (and you never interrupt that), we waited and made the decorating of Santa’s face an activity for another day. Plus… it gave the boys two different days of focused mommy time. A win-win! Same with the hat and eyes. I positioned the glue dot. The kid put on the decorations. And then we both giggled at how silly and awesome our little Santa looked! I can’t tell you how much we love our Santa Handprint Ornaments and how proud the boys were to give them to their grandparents. 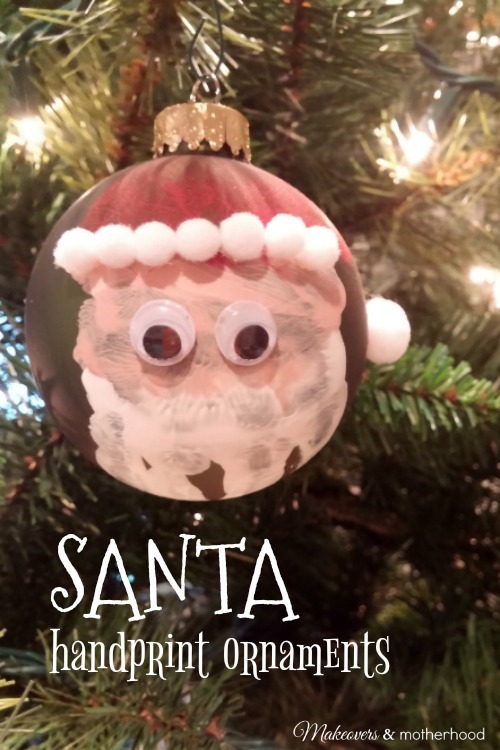 Even though this may be a quick ornament to make, the memories made crafting with your child are timeless. Take time out of this busy season and enjoy your little ones, dear friend! You’ll both appreciate it!